HOW TO ADD NEWS TO YOUR WEBSITE? 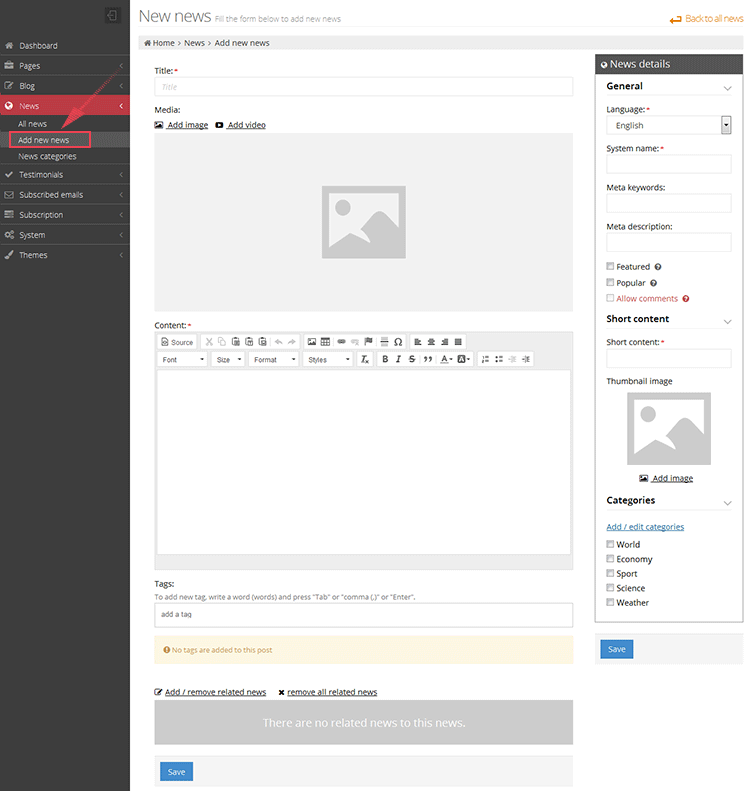 All the predefined Webstrian websites come with precreated news. Because of that, the method for adding a news to your website depends on whether you will delete the existing news articles and start from "scratch" or you will change/edit the existing ones. HOW TO ADD NEWS TO THE WEBSITE WHEN YOU HAVE ERASED THE EXAMPLE NEWS PAGES? - To write your news article go into the left administrative menu and click on "News -> Add new news." The page for writing news and all the news related elements will be opened. On this page, write the content of the news and click on the “Save” button. - This step is under assumption that you have deleted the news pages. 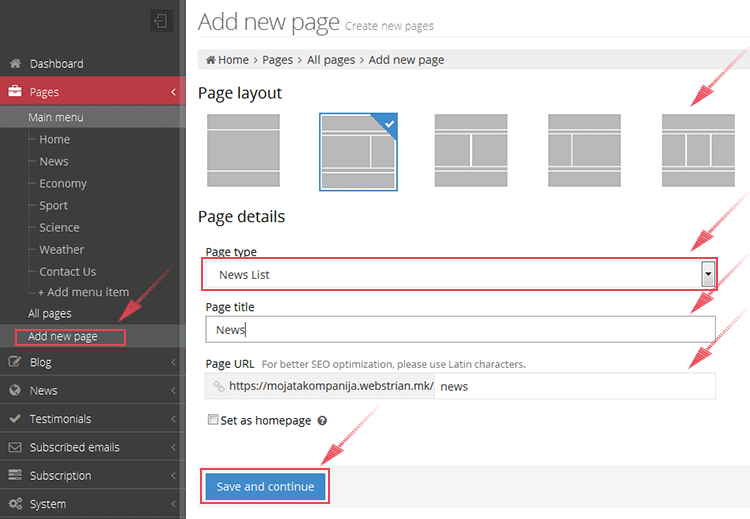 If this is the case, then to add a new page for the news you have to do this: from the left administrative menu click "Pages -> Add new page" and on the page that will open - choose the structure of the web page (we advise you to choose a structure with two columns). Then, from the drop down menu under "Page type" choose "News list". Finally, enter a title for the page as "News" and enter the page URL. Once you finish, click "Save and continue” and the system will create for you a blank news page. - After you create a news page, it is necessary to add the element “News list" in order to display the news articles on your website. 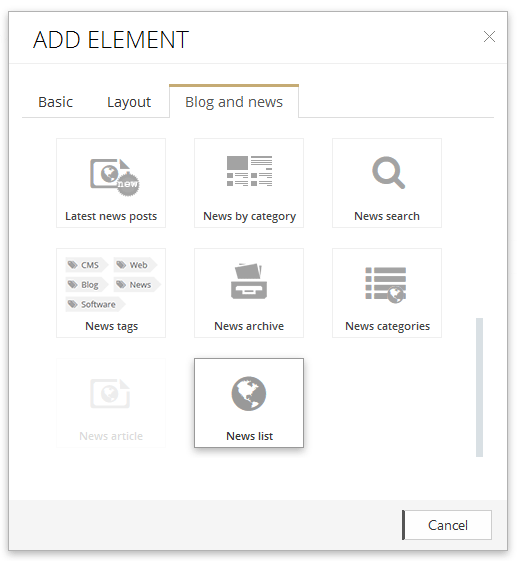 This element can be found in the "Add element" window or more precisely, into the third tab - "Blog and News". Just add the element "News list" and all the news articles will appear on your website. HOW TO ADD NEWS TO THE WEBSITE BY MODIFYING THE EXAMPLE NEWS ARTICLES? In this case the news, the news pages and the news articles are already posted on your website. You will need to change the existing news articles (i.e. add your own text and images) and delete those that you don’t need. 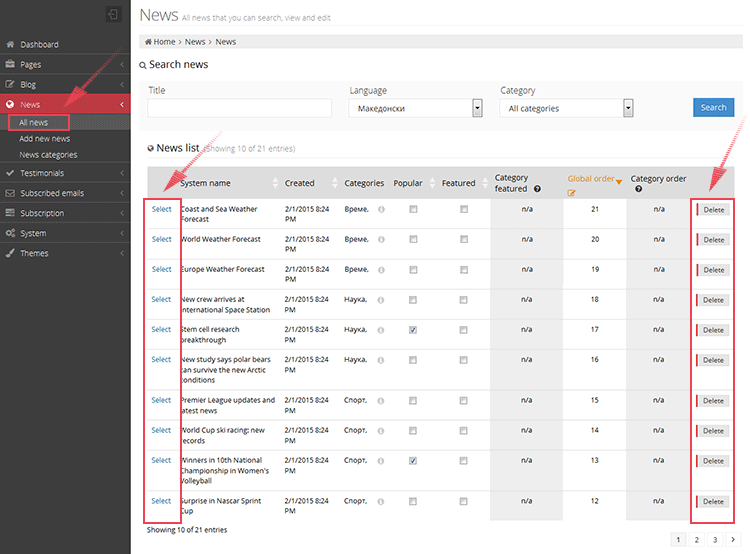 In the left administrative menu click the "News -> All news" link which will open the list of all the example news articles. Select the article you want to edit by clicking on the "Select" link. A new page where you can edit the article will be opened. Find out more about how to edit the article in the section "How to edit a news article" . From the left administrative menu under the "News" menu item select "All news ". You will see a page that will show the current news articles. To delete an article, click the "Delete" button located on the right end of the line that represents the article.